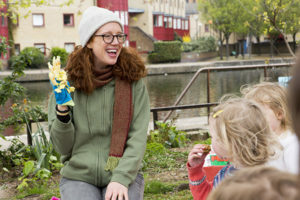 The Garden Classroom was set up as a not for profit social enterprise by Marnie Rose in November 2008. 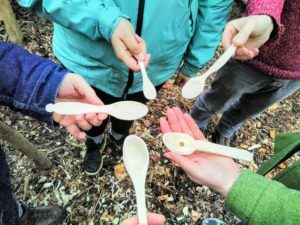 We started small, designing nature-learning sessions at King Henry’s Walk Garden in Islington for one local primary school. What’s unique about The Garden Classroom is that we pop up in parks and gardens all over the borough, close to schools. We offer high quality interactive half or full-day sessions linked to the literacy, maths and science curriculum. 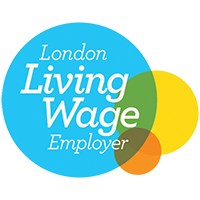 Last year we provided more than 200 learning sessions for 30 schools and more than 6000 children and now operate in ten venues in Islington and Kent. Find out more about our brilliant staff, volunteers and trustees. 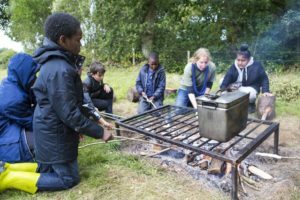 Our programme has evolved organically and when children asked if they could camp at our Kent venue we secured funding and set up a Brilliant Residentials programme. This year pupils will be camping in two rural venues, Chiddingstone and a new site beside the sea near Dover. 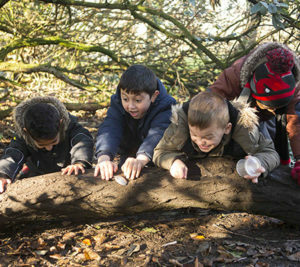 In 2018, our tenth birthday, 50,000 children have learnt outdoors in a natural environment with The Garden Classroom. We’ve won local and regional awards, a national innovation award from the Council for Learning Outside the Classroom and we were shortlisted for the best new small charity of the year at the Charity Times Awards in 2017. Islington has the least green space per person of any borough in the country. It’s also a zone of social deprivation so its really important that our children should be given access to the natural environment that other children have as a matter of course. By working largely through schools we can ensure that every child has an equal opportunity to enjoy the pleasures of nature and its lessons, which are the birthrights of all of us.